The way in which a wine is served will have a significant impact on how it is enjoyed. Serving a wine at the correct temperature and allowing a wine to ‘breathe’ are essential in letting the full range of flavours express themselves. If in doubt see the guidelines on the reverse of the wine bottle. Refrigerate a wine in a fridge or freezer if necessary. If using a wine bucket, fill with half cold water and half ice so that the bottle is submerged up to the neck. 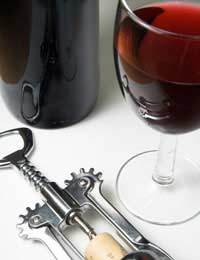 Wines should be taken from the cellar and stored upright prior to serving, sometimes for as long as a day. This will allow any sediment to return to the bottom of the bottle. Decanting allows a wine to ‘breathe’. A decanter is a tall glass with a wide opening, which allows the particles that create aromas to build. It also, and this is the main reason for decanting, allows sediment to be removed from a wine. By pouring slowly, with the neck of the wine to the light sediment can be observed and pouring stopped before it reaches the decanter. Decanting is something that should be done out of site of guests, although the decanter may be placed at the table once the wine had been poured into it.Mass produced new world wines are less likely to need decanting due to the industrial filtration processes employed in their production. Wine should be poured anti clockwise away from the host, with each guest having their glass filled two thirds full, unless they specify that they would like less wine. Pour to the centre of the glass, except if you are serving sparkling wine, which should be poured to the side of the glass. Allow four glasses for the first hour of a meal per guest, and then one for every hour thereafter. Some guests will consume more than others, but it should even out. Good all purpose wine glasses can be bought quite cheaply from supermarkets or home stores. This will suffice for both red and white wines, although separate glasses can be purchased for red and white, with red glasses being more spherical. Sparkling wine should always be served in flutes, and Sherry and Port in their respective glasses. Some people argue that the best wine should be consumed early whilst guests are fully sober, and that poorer wines should be served when the guests are semi way to being inebriated. Whilst there is some sense in this as guests will be less appreciative of a very good wine later in the evening, it is possible to serve a good quality wine but not extraordinary wine, thereby reaching a happy compromise. Good wine will be complimented by good food, so try and have appropriate accompaniments throughout the evening. See related articles for tips on this.